Why can I not indicate a "favorable sole stress" when punching through a floor slab on a wall corner or at a wall end? Where is there an input option? When proving a wall corner or a wall end in RF-STANZ Pro according to DIN EN 1992-1-1, you do not have to enter the counteracting soil pressure separately. The module determines the punching load when detecting at a wall corner or a wall end from the integration of the shear forces in the critical round section. As a result, the part of the ground pressure within the critical round section is not used anyway in the determination of the punching force, so that it does not have to be deducted separately. The situation is different when you analyze the punching of an individual support. By default, the support normal force for the punching load is set there. In this case, you can also specify a ground pressure under the floor or foundation slab. You will find the input option in the form 1.5 of the RF-STANZ Pro module. 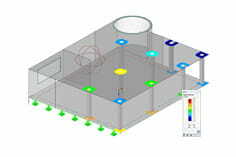 The size of the area load to be subtracted can be determined in RFEM by evaluating the contact stress σzdetermined from the relevant load case or the relevant combination and entered manually in the module 1.5 in the module.